January 18th, on this day in 1882, A.A. Milne, creator of Winnie-the-Pooh, is born. The youngest of three sons born to schoolteacher parents, Milne taught himself to read at age two. He began writing humorous pieces as a schoolboy and continued to do so at Cambridge, where he edited the undergraduate paper. In 1903, he left Cambridge and went to London to write. Although he was broke by the end of his first year, he persevered and supported himself until 1906 with his writing. That year, he joined humour magazine Punch as an editor and wrote humorous verse and essays for the magazine for eight years, until World War I broke out. While at Punch, he wrote his first book-for adults, not children. In 1913, he married his wife, Daphne, and two years later went to France to serve in World War I. While in the military, he wrote three plays, one of which, Mr Pim Passes By, became a hit in 1919 and provided financial security for the family. In 1920, the couple’s only son, Christopher Robin, was born. In 1925, the family bought Cotchford Farm in Sussex. A nearby forest inspired the 100-Acre Wood where Winnie-the-Pooh’s adventures would be set. Milne published two volumes of the verse he wrote for his son. When We Were Very Young was published in 1924, followed by Now We Are Six in 1927. 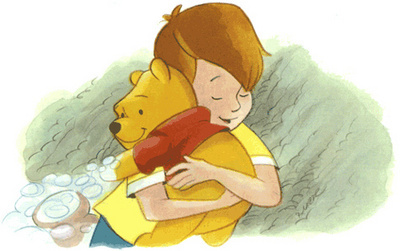 When Christopher Robin was about a year old, he received a stuffed bear as a present. The child soon accumulated a collection of similar animals, which inspired Milne to begin writing a series of whimsical stories about the toys. Winnie-the-Pooh was published in 1926 and The House at Pooh Corner in 1928. Ernest Shepard illustrated the books, using Christopher Robin and his animals as models. 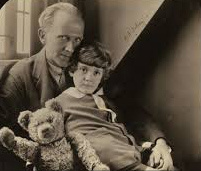 A.A. Milne wrote numerous other books and plays but is remembered almost solely for his beloved children’s work. He died in 1956.